Regular kitcar showgoers may have noticed the re-appearance this season of the Healy (their spelling not ours!) 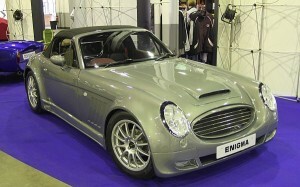 Enigma, which first hit the scene in 2006 before disappearing again. The team behind the car, Martin Williamson (original importer of the Sebring International range to the UK, back in the day), Mick Snell and Joe Lamberti have been busy re-inventing it, converting it from the original Ford Granada mechanicals and Ford Cologne V6 power to Mazda MX-5 mechanicals. Although Joe has taken a step-back, it was he who originally approached MG Rover with the idea resulting in board-level meetings with a view to making the project a sister to the MG SV, with the idea being to produce it in the same Italian factory (ex-Qvale) as the SV (formerly the Qvale Mangusta), and using Rover 75 running gear and engine, although ultimately it didn’t progress any further, mainly due to MG Rover collapsing in 2005. Martin and Mick have created a brand new spaceframe chassis although have retained the distinctive New Mini headlights and Nissan Micra rear lens clusters. An option using the current Mk3 MX-5 is in development, incidentally. Anyway, the revised Enigma is certainly distinctive and of high build quality and the Thetford-based company has gone to great lengths to ensure ease of build and an affordable price, with Martin costing a typical build right down to the last penny. The kit costs £6250, and he reckons that a completed self-built example can be completed for £15,046, which seems like great value for money. We’ll be driving the Healy Enigma very soon, for a tkc mag feature. In the meantime, contact Martin on 07584 087 056 ENDS. Print article This entry was posted by admin on September 6, 2013 at 8:24 am, and is filed under News. Follow any responses to this post through RSS 2.0. Both comments and pings are currently closed.